We had a fun and flowing event that was enhanced by the kiss of a gorgeous day and beautiful sunset. 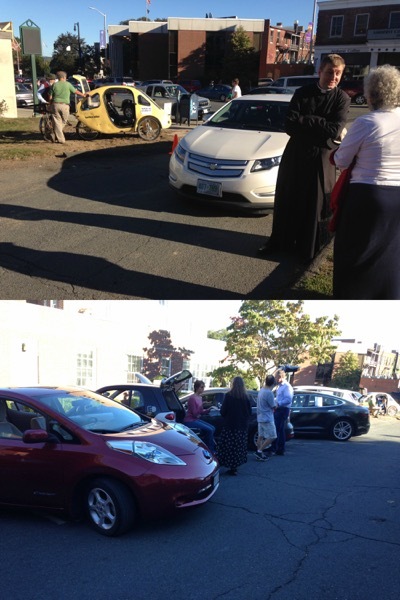 In addition to the people who registered online and those I had specially invited, our display of 2 Teslas, a Ford Focus EV, a Smart EV, 2 Leafs, 2 Volts and a PEBL human/electric 3 wheel vehicle attracted approximately 40 people of various ages and interests. It was a respectable turn out despite the fact that our display area was somewhat obscured by physical and visual impediments, as part of the construction of a new sidewalk and crosswalk in front of the public library which hosted our event. Our inclusion of the PEBL resonated with many participants. I have been organizing sustainable transportation events since the early 90's. The single most delightful thing that happened during this event or has ever happened during one of my events, was the arrival of Father John in clerical garb with his Volt. He joined right in with the promotion of EVs. See attached photo. Is Bob Lutz right about Tesla being a Cult? Learn more about the PEBL pedal electric bike. Registered attendees report 106,700 electric miles driven.